The board of trustees of both the University of Illinois and The John Marshall Law School have voted to create UIC John Marshall Law School — Chicago’s first and only public law school. UIC initiated informal discussions with The John Marshall Law School leadership in 2016. Subsequently, the parties determined that the transaction would be financially feasible without requiring any new state funds. At the closing, significant John Marshall assets will transfer to UIC and the University of Illinois Foundation. The law school’s real estate in the Loop will initially be leased and then transferred within five years. UIC will bear no financial obligation for the acquisition and will fully integrate the law school into UIC after the closing. In addition to providing current and prospective students with a more affordable legal education, UIC’s acquisition of John Marshall will create opportunities for interdisciplinary courses and new joint and dual-degree programs aligned with UIC strengths in disciplines such as the health sciences, engineering and technology, urban planning and public administration, the social sciences and business. John Marshall joining UIC will also open up new possibilities for research collaborations between UIC and John Marshall faculty. The UIC John Marshall Law School will require accreditation from the Higher Learning Commission and the American Bar Association’s Section on Legal Education and Admission to the Bar, and approval for a change of control from the U.S. Department of Education. A law school at UIC is also subject to review and approval by the Illinois Board of Higher Education. If the necessary approvals are obtained within the anticipated timeframe, the first entering class of the UIC John Marshall Law School is expected to matriculate in fall 2019. “Chicago is the largest city in the U.S. without a public law school. The UIC John Marshall Law School will fill that gap while also enhancing legal services available to the people of Chicago. We are already putting plans in place to enhance the program of legal education, build innovative programs within a strong public university, and continue the law school’s long-standing efforts to increase diversity in the legal profession,” said John Marshall’s Dean Darby Dickerson, who will stay on as dean of the UIC John Marshall Law School. Both institutions have track records of excellence in research and scholarship, access for underserved students, and service to Chicago and its people. “Our shared commitment in these areas guarantees that the doors of UIC John Marshall Law School will continue to remain open to all aspiring law students regardless of their socioeconomic backgrounds,” said Paula Holderman, President of the Board of Trustees of The John Marshall Law School. Approximately 900 Juris Doctor (JD) students and 117 Master of Laws (LLM) and Master of Jurisprudence (MJ) students are currently enrolled at John Marshall. The school expects to add a fall 2018 entering JD class of about 280 students. When the transaction closes, John Marshall students will become UIC students and will have enhanced student services, including access to health care services, recreational facilities, residence halls, and college athletics. UIC students will benefit from access to law courses and opportunities to take classes jointly taught by John Marshall and UIC faculty. The new UIC John Marshall Law School will continue to operate at its downtown Loop location at the corners of State Street, Jackson Boulevard and S. Plymouth Court and will become the 16th college at UIC. The dean will report to the UIC Provost and John Marshall staff will become UIC employees. UIC also welcomes John Marshall alumni to the UIC community. The University of Illinois at Chicago is a major research university located in the heart of one of the world’s greatest cities. As Chicago’s only public research university, UIC is an integral part of the educational, technological and cultural fabric of Chicago. UIC is recognized as one of the most ethnically rich and culturally diverse universities in America. The university has 15 academic colleges where students are able to study fields ranging from the health sciences, business, engineering and education, to liberal arts and sciences, urban planning, and architecture, design and the arts. 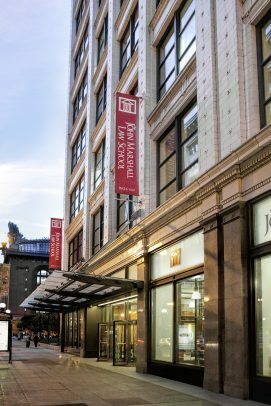 The John Marshall Law School, founded in 1899, is an independent law school located in the heart of Chicago’s legal, financial and commercial districts. The 2019 U.S. News & World Report’s American’s Best Graduate Schools ranks John Marshall’s Legal Writing Program 6th, its Trial Advocacy Program 20th, and its Intellectual Property Law Program 15th in the nation. Since its inception, John Marshall has been a pioneer in legal education and has been guided by a tradition of diversity, innovation, access and opportunity. Al Bowman, Executive Director of the Illinois Board of Higher Education and former president of Illinois State University: “UIC and John Marshall Law School are exemplary institutions with similar guiding principles to provide access and opportunity for students who are underserved, who are first generation, and who may not follow a traditional path to higher education. This new partnership provides innovative and expanded opportunities for students in Illinois who are seeking an affordable professional law degree from a public university in the heart of Chicago. Daniel B. Rodriguez, Dean and Harold Washington Professor, Northwestern Pritzker School of Law: “The planned merger between UIC and John Marshall Law School is terrific news for both institutions. Likewise, it is terrific news for the lawyer community of Chicago and Northern Illinois. John Marshall has a long and distinguished legacy in the region for educating impactful lawyers and advancing the profession through the good works of their students, faculty, and esteemed graduates in the bar and bench. The timing of this merger is especially ideal, as the legal profession is demanding creative responses to our contemporary challenges, including the access to justice gap and the protection and advancement of the rule of law. This marriage of two innovative centers of learning is indeed a creative response.